Caricature of our ferry as theme in colours in A2 size. 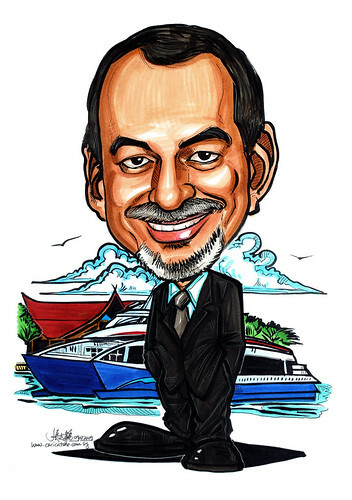 (pls refer attached image of BRF ferry & picture of Mr Frank Singam, the Indian guy with moustache)...."
This artwork comes out better than my expectation, in terms of execution and composition. At my first glance at the photo of the subject, I know that I will enjoy drawing his face. The face is the soul of the drawing. When it turns out good, the rest will follow smothly an dnicely. 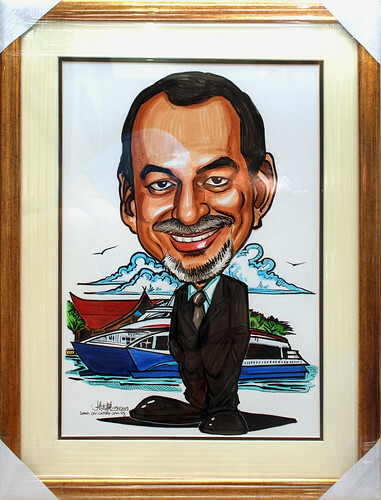 This frame blends in quite well with the caricature artwork. Posted up here, in case other clients need some ideas when it comes to picking their frames.